Jessica M. Vaughan is the Director of Policy Studies at the Center for Immigration Studies. In 2013, ICE freed 36,007 convicted criminal aliens from detention who were awaiting the outcome of deportation proceedings, according to a document obtained by the Center for Immigration Studies. This group included aliens convicted of hundreds of violent and serious crimes, including homicide, sexual assault, kidnapping, and aggravated assault. 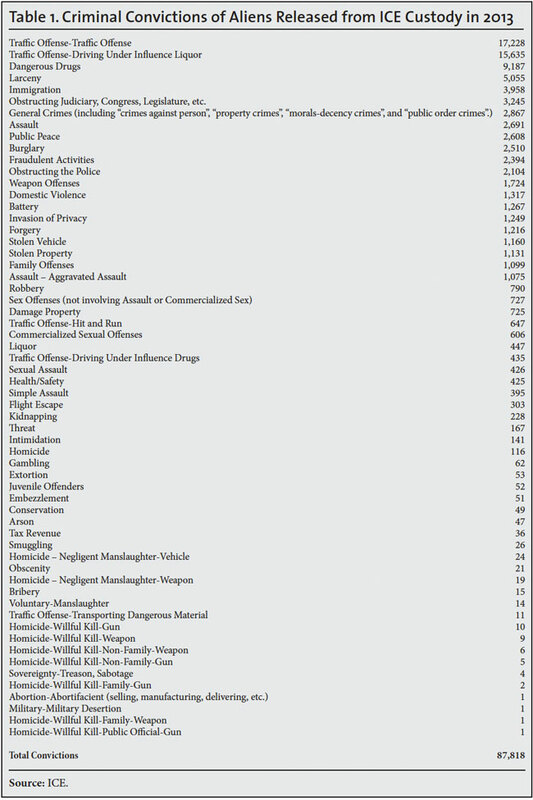 The list of crimes also includes more than 16,000 drunk or drugged driving convictions. The vast majority of these releases from ICE custody were discretionary, not required by law (in fact, in some instances, apparently contrary to law), nor the result of local sanctuary policies. This enumeration of FY 2013 criminal aliens freed and the criminal convictions tied to these individuals was prepared by ICE in response to congressional inquiries following a report published by the Center for Immigration Studies. That report, “Catch and Release”, showed that ICE officers declined to bring immigration charges in 68,000 cases of criminal aliens they encountered in 2013. It is important to recognize that the 36,007 criminal aliens counted in this document are a different set of cases from the 68,000 releases reported earlier. The 36,007 criminal aliens counted here are aliens who were being processed for deportation and were freed while awaiting the final disposition of their cases, or afterwards. The 68,000 releases were cases of alien criminals encountered by ICE officers, usually in jails, but who were let go in lieu of processing them for immigration removal charges in that year. 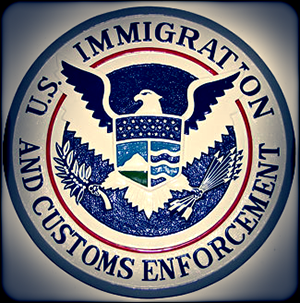 The 36,007 criminal aliens itemized in this document were released by means of bond; order of recognizance (unsupervised); order of supervision (which can consist of nothing more than a periodic telephone call to a designated ICE telephone number); an alternative to detention (such as an electronic ankle bracelet, or other form of tracking device); or parole (a form of legal status). The ICE document does not specify the number or type of criminal aliens released according to the form of release. Separate information obtained by the Center for Immigration Studies reveals that the vast majority of these releases were discretionary, or even contrary to the requirements of various provisions of the Immigration and Nationality Act. Only a small share of these criminal aliens (fewer than 3,000) were released in accordance with a 2001 Supreme Court decision, Zadvydas v. Davis, which prevents ICE from indefinitely detaining certain aliens whose countries will not accept them back. (See “Reining in Zadvydas v. Davis”.) Another small number may have been offered parole or legal status, either in exchange for their cooperation with ICE or another law enforcement agency in connection with a criminal prosecution, or because of another compelling public interest. This document raises questions about the Obama administration’s management of enforcement resources, as well as its enforcement plans and priorities. For instance, a series of directives to ICE agents and officers known as “prosecutorial discretion”, and the implementation of the Deferred Action for Childhood Arrivals (DACA) program, have made certain broad categories of illegal aliens off-limits for enforcement. These policies have forced ICE officers in the field to avoid or cease deportation action in thousands of cases, even in cases of aliens charged with or convicted of crimes. ICE officers have testified in federal court that some arrested aliens have claimed to be eligible for DACA knowing that they likely will be released from custody and from immigration charges without verification of their claims. ICE should be asked to disclose how many and which of the 36,007 criminal alien releases occurred due to these recent policy changes. In addition, over the last year certain advocacy groups have called for the Obama administration to scale back the number of deportations or halt them altogether. A number of criminal aliens in detention while awaiting completion of deportation proceedings have been the subject of petition campaigns, prayer vigils, demonstrations, and other forms of protest against enforcement. Typically these protests occur on behalf of a criminal alien who has family members in the United States. ICE should be asked to disclose how many of these releases came after such appeals were made on behalf of criminal aliens. These figures call into question President Obama’s request to Congress for permission to reduce immigration detention capacity by 10 percent in favor of permission to make wider use of experimental alternatives to detention. These alternatives already are subject to serious questions about their efficacy and cost, and ICE’s methodology for evaluating the results needs to be carefully scrutinized. The reduced detention bed-space request, submitted as part of the executive branch’s budget plan, comes at a time in which ICE’s detention space needs are expanding due to rapidly increasing illegal arrivals along parts of the southwest border and continued high numbers of criminal aliens encountered by agents in the interior. The news that ICE released so many criminal aliens convicted of so many serious and violent crimes suggests that ICE could use more detention capacity, not less, in order to prevent further harm to the public from these individuals. ICE should be asked to track and disclose what additional crimes may have been committed by these individuals after their release. ICE devotes very few resources to victim assistance and notification programs, and these meager efforts are focused primarily on helping victims of human trafficking rather than those who have been harmed by alien criminals. In fact, the only “ombudsman” type of position ICE has established — and maintained even in the face of specific congressional de-funding of the position — focuses on aiding illegal aliens, not their victims. ICE should establish a notification system, modeled on the most successful federal, state, or local victim-witness assistance programs, to alert the victims of alien criminals, local law enforcement agencies, and the public when violent or dangerous criminal aliens are released from its custody. The criminal aliens released in 2013 had more than 300 convictions for “flight escape,” indicating that they had a prior history of fleeing from authorities. Experience (and common sense) suggests that such individuals would be poor candidates for release while awaiting possible deportation. Studies have shown that fewer than a quarter of deportable aliens who are released from custody while awaiting the outcome of immigration proceedings will show up for immigration court to finish their case. The departments of Homeland Security and Justice should be asked to disclose how many of these criminal aliens became fugitives after their release from ICE custody. The revelation that 36,007 criminal aliens were released from ICE custody in 2013, an average of nearly 100 per day, is shocking, and could further shake public faith in the effectiveness of current immigration enforcement policies. This information is sure to raise concerns that, despite professions of a focus on removal of criminal aliens, Obama administration policies frequently have allowed political considerations to trump public safety factors and, as a result, aliens with serious criminal convictions have been allowed to return to the streets instead of being removed to their home countries. DHS Secretary Jeh Johnson is on the verge of announcing the results of a review of deportation policies, ordered by the president in response to immigrant advocacy group protests. Most observers believe this review will result in policy changes to further expand the number and categories of illegal aliens who effectively are exempt from immigration enforcement and, if experience is a guide, will further increase the number of criminal aliens who are released instead of deported. Lawmakers and the public must insist that DHS fully disclose and be held accountable for the public safety impact of any additional deportation policy changes.